Gayle, Cailin, and Eric flew back to NC on 8 April to complete homeschool testing and participate in a couple of local homeschooled acivities planned moths ago. Nonetheless, it was very hard and emotional to see them off. I am making preparations for some singlehanded sailing down island. The exact destination is undetermined. I’ll have to make a decision by 15 May either to turn NE and sail back to NC or sail to the SE for Grenada. Our reunion plans will be built around the chosen destination. It has not been this quiet on the Far Reach in months. We are both feeling a little lonely. Eric looking aft and enjoying his perch as we sail towards Jost van Dyke. 5 Apr 2015, The Far Reach, Anchored Elepahnt Bay, St Thomas, USVI — We departed the North Sound on 15 March and sailed down to the baths were once again we picked up a mooring for a few hours and enjoys swimming off the boat in the clear blue tinted water. Afterwards we sailed north about a mile and anchored over night off Spanish Town. 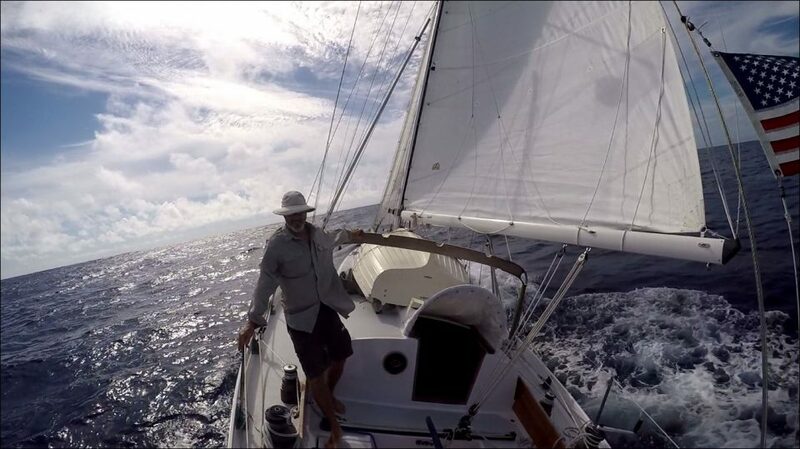 Next day, we weighted anchor about 0830 and had a fine sail running east downwind in the Drake Channel then reaching north through the Thatch Cut to Jost van Dyke.